kt literary » Blog Archive » More great news for Krista! More great news for Krista! 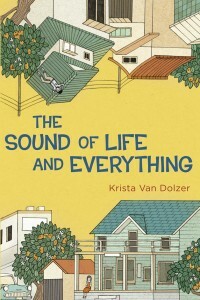 More good news for The Sound of Life and Everything, which earned a lovely review from VOYA Magazine. Congrats, Krista! When Ella Mae Higbee goes to Pasadena with her mom and Auntie Mildred, she never thought she would be going to a laboratory that grows people. Dr. Franks at Ingolstadt Laboratories promises to bring loved ones back from the grave with just a sample of their blood. Devastated by losing her son Robby in World War II, Auntie Mildred uses the blood on his dog tags to get him back, except something goes wrong with the experiment. The blood from the war did not belong to Robby, but a Japanese soldier. Neither Auntie Mildred nor Dr. Franks will take responsibility for the life they created, but Ella Mae and her mom know that caring for him is the right thing to do. Taking in Takuma is not as easy as they thought it would be: because of his nationality, the entire town—still grieving from several losses from the war—sees him as the enemy. Prejudices are strong and several organizations in St. Jude refuse to welcome Takuma: the local clothing store will not sell anything to him, the principal will not allow him to go to school, and the pastor turns him away from the church. This post-Second World War novel poses themes of prejudice, humanity, scientific discovery, history, and conscience. By mixing elements of science fiction with a historical setting, Van Dolzer presents serious subject matter in an age-appropriate way. This novel would be perfect for classrooms and book clubs, as it definitely offers a lot of material for discussion. ← Happy Book Birthday to WHAT A LADY REQUIRES!